Burundi has become the first country to withdraw its membership from the International Criminal Court (ICC). It accused the ICC of deliberately targeting Africans for prosecution. 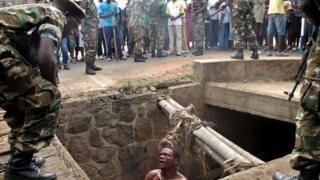 The government of Burundi is accused of committing crimes against humanity, including execution and torture. The UN Commission of Inquiry is urging the ICC to open a prosecution soon. In theory its withdrawal from the ICC has no effect on the court's ongoing investigations on the country. Fadi El-Abdallah, a spokesman for the ICC, told the BBC's Newsday programme that "article 127 states that withdrawal does not affect the jurisdiction of the ICC over the crimes that have been committed" while the country was a member. But the case of Sudan's President Omar al-Bashir, one of the ICC's "most wanted", has highlighted the difficulty of getting a non-member to co-operate in surrendering suspects. The withdrawal comes a year after Burundi lodged an official notice to quit the organisation, which has 122 member countries, 34 of which are African nations. In 2015, Burundi saw major unrest and a crackdown by the security forces after President Pierre Nkurunziza decided to run for office for a third time, leading to protests from the opposition which deemed it unconstitutional. The BBC's Anna Holligan in The Hague, where the ICC is based, says Burundi's decision to leave the ICC is unprecedented - a statement that if you don't like the focus of the prosecutor, you can simply leave. She adds that the real impact - and whether or not it creates a domino effect - will be determined by what happens next. Kenya and South Africa have made similar threats to withdraw their membership.